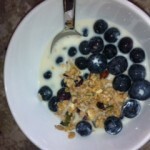 Nicky’s main goal was to produce a natural, unprocessed breakfast that all the family could enjoy. 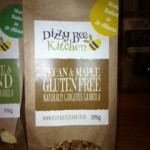 The original 3 varieties are Nourishingly Nutty, Fabulously Fruity and Super Seeds which each contain a mixture of baked oats, jumbo oats and oat bran sweetened with a little Hertfordshire honey and toasted with locally sourced rapeseed oil. Different mixes of sunflower, pumpkin, sesame, flax and chia seeds are added along with some nuts and dried fruits depending on the variety. The seeds not only provide a good source of protein to keep you full until lunchtime but also important omega 3 and 6 fats which are vital for healthy skin and hair, reducing inflammation and balancing hormones. The first is Pecan and Maple Gluten Free which includes gluten free oats, quinoa and puffed rice along with seeds and coconut. It’s refreshing to find a gluten-free granola which is full of flavour and crunch rather than feeling like you’re chewing sawdust. 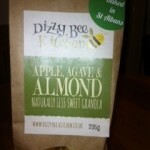 Finally there’s Apple, Agave and Almond- Naturally Less Sweet Granola. If you’re looking to reduce the sugar in your diet then this is the best in the range. A 40 g serving contains only 2.1g of sugar compared to the whacking 9g or more you’ll find in many of the granolas on your supermarket shelf. It may be less sweet but it is certainly full of flavour containing pistachios, dried apple, almonds and sweetened with a little agave nectar and Hertfordshire apple juice. I must add that all the varieties in the range are much lower in sugar than the majority of big brand granolas. I usually eat mine with a handful of fresh berries and almond milk but it also works well with any chilled milk or natural yoghurt. You could also enjoy a handful as a snack when energy is flagging in the afternoon.